In a move with wide-reaching implications for the real estate industry, President Donald Trump imposed new tariffs on imported steel and aluminum on March 8, 2018. The tariffs of 25% on imported steel and 10% on imported aluminum have already created strain on international trade relationships, with 24 World Trade Organization countries scheduled to meet in India in mid-March to discuss this issue, among others. The move raises questions of whether this is a singular action or a precursor of additional future tariffs on behalf of the Trump Administration, and it has formed fears of a trade war resulting from retaliatory tariffs. Meanwhile in the U.S., the construction industry has taken notice. Some of the nation’s largest steel producers including US Steel and ArcelorMittal have publicly issued statements in support of the tariffs, indicating that the move is a step in the direction of evening the playing field for US steel producers. While the new tariffs would undoubtedly be positive for those producers, it would also certainly raise the cost of production of steel-based products such as automobiles and many large-scale real estate developments. 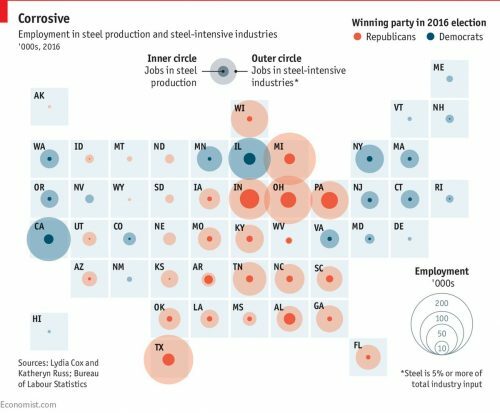 The effects on the steel industry and other related industries will likely be uneven across the U.S. as a result of the geographic distribution of these industries. A policy brief from The Trade Partnership estimated that the tariffs would result in the addition of over 33,000 jobs directly in the U.S. steel and aluminum industries, but that these gains would be overshadowed by potential loss of approximately 179,000 jobs in related industries such as fabricated metals, automobile manufacturing, and other transportation equipment that would be hurt by rising raw materials costs. Real estate investors will have to take notice of the geographic impacts of these potential job additions or losses across the country and their resulting effects on real estate fundamentals, particularly in the office and industrial sectors. To better understand those impacts, consider the following map illustrating the distribution of U.S. steel production employment as well as employment in steel-related industries. Clearly the largest positive impact directly in the steel production industry would come in the nation’s Rust Belt, with historically famous steel producers such as Pittsburgh, Cleveland, and the surrounding areas seeing the greatest potential for job gains. However, the distribution of steel-related industry jobs is far more diversified, but the same areas of the Rust Belt that may benefit the most from direct steel production may also be those that see the greatest negative effects in steel-related industries. States with a historical automobile manufacturing presence such as Michigan and Ohio could take another significant hit, along with states like Texas and California to which many of the automobile manufacturing jobs have already fled. The U.S. imports only approximately one-third of its steel, and approximately 26% of that imported steel comes from Canada or Mexico which have been exempted from the new tariffs. This means that approximately 25% of all steel used in the U.S. would be subject to the new 25% steel tariff. Simply estimating that the cost of 25% of steel would increase by 25% would imply an expected increase in average steel cost of 6%. However, the impact of the tariff would also impact the supply/demand relationship for steel without a tariff, likely driving up steel prices across the board. Nonetheless, with steel representing approximately 20% of construction costs for mid- and high-rise steel-frame buildings, a 6% increase in steel prices would imply only a 1% to 2% increase in average construction costs. According to the American Iron and Steel Institute, the construction industry accounts for 43% of all steel imports into the U.S. With most single-family residential construction taking the form of wood frame buildings, the bulk of the impact will come on large-scale multifamily and commercial real estate developments. With the rise in construction costs since the Global Financial Crisis, construction and real estate firms were already seeking ways to decrease costs over recent years. Trump’s steel and aluminum tariffs will likely continue this push to explore cost reduction through alternative building materials. Developers on the West Coast have already begun their transition through the construction of buildings utilizing cross-laminated timber (“CLT”), a lightweight and sustainable material formed through the adhesion of several wood boards pressed together. CLT has been permitted by the International Building Code (“IBC”) for load-bearing walls since the 2015 code was released, but many cities or states have differing requirements largely as a function of historical views on fire resistance of wood structures that have resulted in caps on building height for wood frame buildings. However, CLT is now rated for two-hour fire resistance, which is allowing jurisdictions to change their stance on wood frame building heights. In Portland, project^ and Home Forward received buildings permits in June 2017 for a 12-story, 148-foot CLT frame development named Framework. The project was the first wood-frame building over 85 feet approved in the U.S. and was partially funded through a $1.5 million U.S. Tall Wood Building award sponsored by the United States Department of Agriculture. Expected to break ground in March 2018, Framework has committed to make its research and testing open source following construction to promote further changes to building codes.